at your location and on your time! Mobile CPR & AED Training Is Here! • You can save a life! 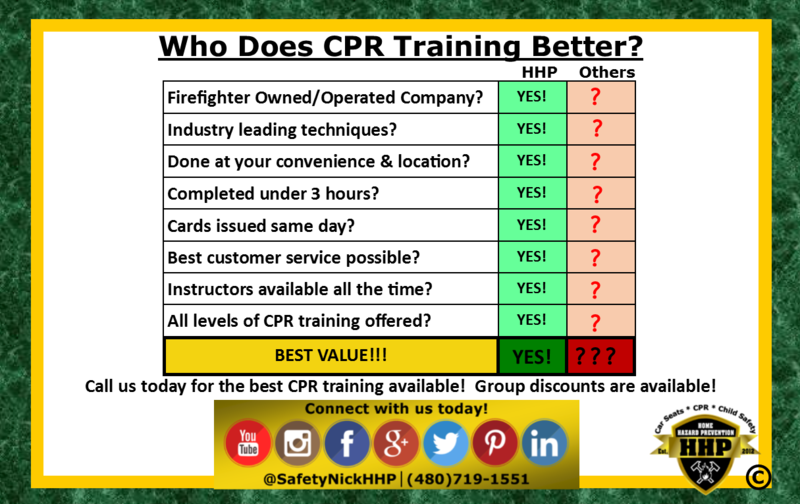 As you can see, the benefits of learning CPR from HHP is one of the smarter things that you can do to help prepare yourself and be proactive in the event of an emergency. We also offer professional level training for those of you whose job requires this essential life-saving training. We are also an authorized distributor for AEDs, which when applied and used in conjunction with hands-only CPR, increase the odds of survival from 7% to over 80%. These little machines are growing in popularity and can be found in most public gathering places. In summary, you should use HHP to learn CPR as we simply offer the best solution to prepare you to be able to save a life when the situation arises. Just think how proud your family will be when you do something truly heroic and save a life.